If you need a good reason to eat ice cream, here are 2: July is National Ice Cream Month and Carvel now has Nutella ice cream. There you go, 2 great reasons to eat ice cream. And, if you are selected as the winner of this giveaway, you can have 2 more great reasons: 2 $10 Carvel Ice Cream gift cards! Carvel is very excited about their new Nutella flavor, and so was I when I set out to try it at my local Carvel. What could be better than cold creamy Nutella ice cream?! Yummy! they even have some great sundaes with the new Nutella flavor! Did you know July 20th is National Ice Cream Day? To celebrate, Carvel is giving Fudgie Fanatics a coupon to get a Jr. cup for only $.80 on that day! If you're not yet a member, make sure to join. Members get free ice cream on their birthday, and if you join before July 20th you'll also be entered to win free ice cream for a year! That's a lot of ice cream! If you love ice cream, you now have a whole lot of reasons to eat it at Carvel; especially if you like Nutella! disclosure: I received gift cards in exchange for completing this post. 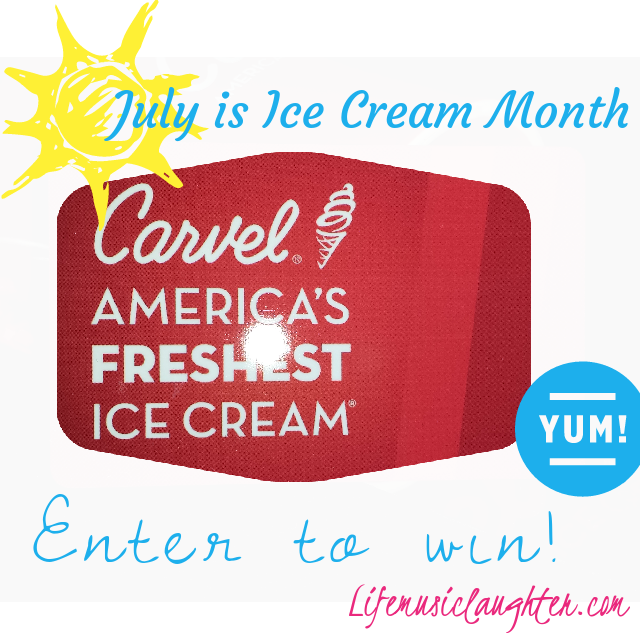 Carvel also provided the prize for the giveaway. All opinions expressed are my own. My favorite ice cream flavor is moose tracks. I like chocolate chip ice cream. i like coffee ice cream! It's a toss up between Mint Chocolate Chip and Strawberry. I love coffee ice cream but am excited to give the Nutella a try! Chocolate Chip Mint is my flavor of choice! I love Cookies and Cream ice cream. I love anything with peanut butter. Chocolate and peanut butter sounds yummy! Fudge Ripple is my favorite flavor. Favorite is vanilla bean with hot caramel on top! At Carvel, I love their vanilla ice cream sundae with hot fudge! I love coffee, or hazelnut chocolate! My favorite flavor ice cream is Cherry Vanilla.